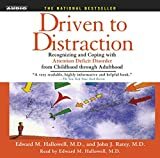 Review of "Driven to Distraction"
In this abridged audiobook, Hallowell and Ratey set out their view of the nature of Attention Deficit Disorder. The audiobook is narrated by Hallowell and a woman who is not identified on the packaging. Hallowell insists that it is a genetic neurological disorder, although he does not mention any evidence for this, and I know of only weak evidence for the claim. ADD probably has some genetic aspect, and of course there are correlations between what goes in in the brain and what goes on in the person, but that does not mean that ADD is a neurological disorder in the same sense that Alzheimer's is. Hallowell also insists that having ADD is very different from being lazy or self-indulgent, and claims that there is a clear distinction between the medical disorder and the personality flaw. Yet he does not provide any clear way of making this distinction except using the diagnostic criteria provided by the American Psychiatric Association, and these are behaviorally based. Behavioral criteria do not refer to the patient's intentions or motives, and so a diagnosis requres no judgments about a patient's moral life. Hallowell asserts that once one has ADD, one always has it, which is a remarkable claim considering that until recently, the existence of adult ADD was believed to be extremely rare. For treatment, Hallowell recommends psychotherapy; not psychodynamic exploration of childhood but rather behaviorally-based coaching that helps people focus their attention better and stop themselves from becoming distracted. He also recommends group therapy, couples therapy, and medication, which tends to be either a stimulant or an antidepressant (although the information about the medications seems rather out of date). No doubt, people do start doing better with these treatments. Yet I would imagine that if one got together a group of lazy, self-indulgent people with low self-esteem who were motivated to change, they too would benefit from such treatment. Driven to Distraction is written clearly and performed well. For people who have problems with focusing and emotional problems that result from the consequences that result, Driven to Distraction will encourage them to see their situation medically, and that may well be helpful. The book says virtually nothing about hyperactivity, and so will be of little use to parents with children who are jumping all over the house and classroom and destroying everything in sight. The greatest flaw of the book is in its readiness to medicalize ADD. I wish that writers of such popular works would be more careful with terms like "neurological" and "genetic," and do not go beyond the available evidence. There may be as much reason to think of laziness as a neurological and genetic disorder as there is with ADD -- surely the brains of lazy people can be found to exhibit some differences from those who are driven, and it would not be at all surprising to find that lazy parents have an increased likelihood of having lazy children. This is no to say that ADD is a moral failing rather than a medical disease; rather it is to say that we have only a tenuous grip on what this distinction is. Probably the best attitude to people who underperform and have difficulty paying attention is not to be judgmental, whether or not their problem is medical, because attitudes of blame and condemnation tend not to be very productive. The virtue of Driven to Distraction is that it does focus on the positive and provides many practical suggestions on how to deal with the problems the come with easy distractibility.